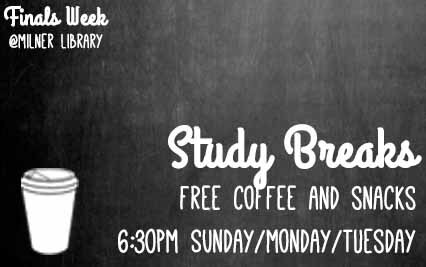 Do you need a break from studying? Milner Library has free coffee (yay caffeine!) and donuts available to help you survive finals week. Come visit us starting at 6:30 p.m. on May 7, 8, and 9. It’s first come, first served. We keep serving until we run out of donuts.